During the years immediately preceding World War 1, with increased competition from private autos and jitney, coupled with the need to reduce the operating costs of the heavy cars in use at the time, which were cutting heavily into street Railway revenues, a need for a smaller lightweight streetcar arose. Enter Charles O. Birney, a master mechanic for the Stone & Webster Engineering Corporation, who in 1916 designed a one-man lightweight car. The car, described as a ‘single-truck, one-man, light-weight safety car’ went into production. The car became affectionately known as the ‘Birney’ car. In 1921, the city of Victoria, British Columbia placed an order with the Preston Car and Coach Company of Preston, Ontario for ten Birney cars. The cars were shipped in pieces to the Kitsilano Workshops of the British Columbia Electric Railway (BCER) in Vancouver, British Columbia for final assembly. The cars were numbered 400 through to 409. The cars went into service in Victoria, British Columbia in March of 1922 under the direction of the BCER. For 25 years Car 400 served the public, until it was retired in 1946. The rest of the series was retired from service in 1948. After retirement the cars had their trucks removed, the controllers stripped and anything else salvagable taken. The car bodies were then sold to the public to become summer cottages, storage sheds or just plain shacks. Car 400 was sold to the Mayo Lumber Company in Cowichan Lake to be used as a bunkhouse. There Car 400 sat for another 20 years, being used for a variety of purposes, until the roof caved in and its bare metal skeleton was exposed. At that point Car 400 was abandoned. 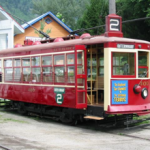 In 1970, Dan Gallacher of the Provincial Museum of British Columbia, in Victoria, concluded that an authentic streetcar which formerly ran in Victoria would be an ideal exhibit for display at the Museum. A quick survey of what relics remained revealed that Car 400 would be the best candidate for restoration. After more than 15 months of restoration and a cost cost of $15,000 dollars, in the Spring of 1973, a restored Car 400 rolled out of the shop. The restored Car 400 was then put on display at the Provincial Museum. In 1990 the Nelson Electric Tramway Society brought Car 400 to Nelson for display. The car was brought here under a lease agreement with the Royal British Columbia Museum, which displayed Car 400 at its Transportation Museum in Cloverdale, British Columbia. In 1992, with the closure of the Tranportation Museum, Nelson became Car 400’s permanent home. At that time the Society began a new restoration of the Car as it had become quite ravaged by the elements. 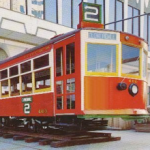 Over the next 7 years Car 400 was slowly refurbished along with the Society’s main streetcar, Nelson Street Railway Car 23. By the fall of 1999 Car 400 was in the finishing stages of restoration ready to be put back into service the following Spring.